An interesting yet disturbing trend of late in the vintage-guitar market is perfectly correct instruments being parted out to meet the demand for rare hardware. Most of us don’t spend a lot of time thinking about the kind of legacy we’ll leave behind. I’m not talking about big ideas like curing cancer or saving the planet from harm. What I am talking about are much more diminutive contributions, or actually, lack of action. A few years ago, I awoke one morning to the sound of chainsaws drifting across my property. I live in a somewhat rural area surrounded by rough, hilly terrain and forest, and have a 600-foot driveway that winds past a section of a neighbor’s land. Following the sounds of trees being felled, I arrived at the point where my plot met his. Seeing me, my neighbor looked up, killed his smoking Stihl saw, and walked over to chat. He explained that his livestock hobby needed more grazing land, so he’d decided to level an acre of tall trees and shrubs. I wanted to continue to enjoy the privacy that the foliage afforded when entering my driveway, so of course I was being selfish as I urged him to reconsider. But it also struck me as irresponsible to just trash an acre of old-growth trees. I’m an advocate of responsible wood harvesting and an avid fan of reclamation, so I reminded him that his deed would remain long after he moved on. Upon consideration, my neighbor compromised and merely thinned out some of his land. This column, however, isn’t directly about forests being decimated for musical instrument use. It’s about stewardship of what already exists. 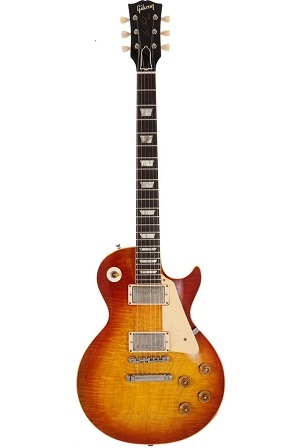 A 1960 Gibson Les Paul Standard Cherry Sunburst electric guitar, one of the most sought-after modern stringed instrumented ever made, proved its worth at $131,450 to lead Heritage Auctions’ $1,682,831 Signature Music & Entertainment Auction, Feb. 20. All prices include 19.5% Buyer’s Premium. Acoustic guitars proved an important part of the stringed instruments section of the auction, and no one name more so than that of C.F. Martin, as a pair of vintage Martin acoustic guitars combined for almost $75,000, with a 1931 Martin OM-28 Natural acoustic orchestra model, #47403, in its original state, with a $46,306 price realized, followed by a striking 1937 Martin-D-18 Sunburst Acoustic, #68135, more than doubled its pre-auction estimate to finish the day at $28,680. The name of Fender was well-represented in the auction, with two classic examples performing well beyond their pre-auction estimates. A 1957 Stratocaster Sunburst solid body electric guitar, #22744, in all original condition, brought $21,510 against a $5,000+ estimate, while a 1959 Fender Telecaster Blonde solid body electric guitar, #38272, brought $20,913, against a $6,000+ estimate. In what was the sleeper of the guitar auction, a fantastic 1961 Rickenbacker 4001 Fireglo Solid Body Electric Bass Guitar, #AK685 – a gorgeous example of this famous model, that can be traced definitively back to the first month of the first year of Fireglo production, brought $19,120, almost five times its pre-auction estimate. 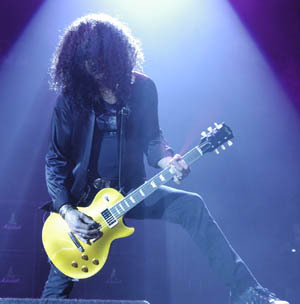 Slash will sell 14 of his prized guitars at auction next month. The former Guns N’ Roses guitarist – who estimates he owns at least 100 of the musical instruments -will sell a Guild acoustic which he used to record the single ‘Patience’ along with various other custom guitars. Slash decided to hold the sale because a recent house move made him realise he has a “bad habit of collecting stuff that I don’t necessarily use”. Along with the guitars Slash will also sell two of his trademark top hats and a selection of jackets, T-shirts and jewellery. A 1966 Corvette Stingray with an estimated selling price of $90,000 is set to be one of the non musical highlights of the sale with the rocker – who released his first solo album last year, and is also in the band Velvet Revolver – with him admitting he will be sorry to sell the “monster of a car” he bought at the beginning of his career. The March 26 sale is being organised through Julien’s Auctions with a sizable share of the proceeds going to a local charity for abused and homeless teenagers. Here’s a nice article by rock writer Binky Philips on the Huffington Post website. Lots of anecdotes about New York guitar buying and the stories of how old guitars get passed around. Anyway, one afternoon later that summer, Teddy Slatus, Edgar Winter’s road manager, came in with both of regular-customer Rick Derringer’s sunburst Les Pauls. Back in those days, years before reissues, that meant two of maybe 900 total Gibsons made between mid-1958 through the end of 1960 with that glorious fade-from-a-red-to-gold transparent lacquer finish over highly figured maple and the then new and powerful (Patent-Applied-For) Humbucker pickups. After several other guitar-obsessions amongst the Stars of Rock Guitar, Keith Richards, Mick Taylor, Michael Bloomfield, Eric Clapton, Jimmy Page, Duane Allman, and several other major cats had settled on this model Gibson as The One. And to this day, it rightly remains exalted. This guitar is considered to be the Holy Grail to many guitar enthusiasts, collectors and musicians. Sunburst Les Pauls were and are played by the most iconic rock stars of any era. Billy Gibbons, Jimmy Page, Joe Perry, Duane Allman, Ace Frehley, Jeff Beck, Paul Kossoff, Joe Walsh, Gary Richrath, Steve Lukather, Gary Moore, James Hetfield, Michael Bloomfield, Peter Green, Gary Rossington, Ed King, Slash, Edward Van Halen, Eric Clapton, Rick Nielsen and many many others. 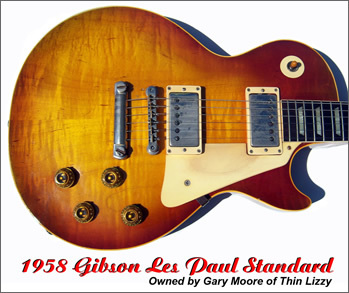 This is a once in a lifetime opportunity to own a vintage Les Paul that has a history that is traceable back to the 1960’s AND was owned by Gary Moore. This guitar is in spectacular condition and has made appearances in numerous magazines and books. The color is fantastic and the top has a very pleasant mild flame. Guitar plays and sounds fabulous. I personally dealt with Gary Moore’s management and tech to acquire this guitar for a collector in 1994 and the experience of working with Mr. Moore’s staff was a great pleasure. Notable Provenance circa 1965-1990 owned by a guitarist who is also a vintage guitar dealer. 1990-1991 owned by English author Richard Chapman. 1991-1994 owned by guitarist Gary Moore of Thin Lizzy. Condition Guitar is in exceptional condition with exception to the following issues. 1. Replacement (formerly gold) correct era pickup covers. 3. Refret and replacement nut made of correct era Nylon. 4. Grovers removed and correct era tuners reinstalled. 6. Guitar is in a flight case. The Gibson Custom Shop has announced the Gibson Custom Jimmy Page Number Two Les Paul Limited Edition guitar, modified by the legendary Jimmy Page himself. Every musician knows that late ’50s Sunburst Les Paul Standards are hard enough to come by as it is. Obtaining a pristine and exemplary ’59 ‘Burst and modifying it for heightened performance and vastly expanded tonal options? Unheard of… unless, of course, you’re Jimmy Page. That’s exactly what the legendary Led Zeppelin guitarist, perhaps the world’s most iconic Les Paul player, did with his own ’59 Les Paul Standard, and now, thanks to the extreme efforts of Gibson’s Custom Shop and the intimate cooperation of Jimmy Page himself–the artist’s hallowed “Number Two” Les Paul is available to mere mortals, in the form of the Custom Shop Jimmy Page “Number Two” Les Paul. Produced in strictly limited numbers, with two levels of aging, this guitar captures the look, feel, sound, and versatility of one of the greatest artist-owned Les Pauls of all time, and it is likely to disappear from authorized Gibson dealers in record time. The 1959 Les Paul that has come to be known as “Number Two” was purchased by Page in 1973 after trying for some time to acquire an exceptional second Les Paul. This was several years after having acquired his other legendary Les Paul–“Number One”, a ’59 ‘Burst with shaved-down neck profile and no serial number–from Joe Walsh. “Number Two” was essentially all original when he acquired it. Jimmy did have some modifications done to the neck shape so that it would more nearly match the feel of his “Number One”. The neck is certainly slim but not to such extremes as the now-ultra-slim neck on “Number One”. It had a strong, beautiful sunburst finish with a red element that had faded to a dusky amber-brown, along with a clear serial number dating it to 1959. Page played this Les Paul frequently through his days with Led Zeppelin, and in the early ’80s decided to make it an even more versatile instrument. Page also added that he wanted to “explore the full range of what the two humbuckers have to offer”. He designed a switching system for coil splitting, series/parallel, and phase-reverse options for both pickups, and employed a skilled electronics technician to devise a working schematic and make his sonic vision a reality. 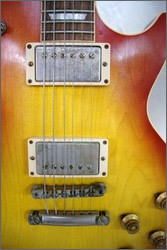 The result comprised a push/pull pot on each of the guitar’s four standard controls, plus two push-button switches hidden beneath the pickguard, all mounted on a ’59 Les Paul Standard that is otherwise a superb example of the breed, both in tone and playability. The Custom Shop Jimmy Page “Number Two” Les Paul was recreated with intense, inch-by-inch examination of Page’s original guitar, inside and out. The process of getting it right involved the production of a number of hand-built prototypes, each of which was checked and critiqued in detail by Page himself. Approval of the final iteration was only offered after the legendary artist had intricately examined and extensively played this last prototype in his London home, after which it was given the thumbs-up, worthy of being the template for the Custom Shop Jimmy Page “Number Two” Les Paul. Only 325 examples will be produced in total: The first 25 instruments are to be aged by vintage-reproduction master Tom Murphy then inspected, played and hand signed and numbered by Jimmy Page personally. An additional 100 guitars will be given the extensive aging treatment and 200 will be finished to Gibson’s VOS specs. Gibson Guitars, long lauded by environmental groups as a pioneer in the use of sustainable wood products, is the first U.S. company to face prosecution under a new federal law banning trade in illegal wood. â€œThis is the first enforcement action that we are aware of, and we are extremely encouraged that the government is taking this new tool so seriously,â€ said Alexander von Bismarck, executive director of Environmental Investigation Agency, a nonprofit group that investigates international environmental crime. That â€œnew toolâ€ is an amendment to a century-old law called the Lacey Act, which combats trafficking in illegal wildlife, fish and plants. Congress expanded Lacey in May 2008 to include timber and wood products, making the United States the first in the world to regulate trade in plants and plant products. Declaration requirements went into effect in May of this year. According to the EIA, which fought for more than a decade to get the amendment passed, Gibson is the first in the country and, by default, the world, to be investigated under the new provisions. Penalties for violations of the Lacey Act range from a simple forfeiture of goods to fines of up to $500,000 and prison time if the company or individual is found to have knowingly engaged in the trade of illegally sourced wood. Agents with the U.S. Fish & Wildlife Service executed a search warrant at Gibsonâ€™s Nashville guitar plant on Tuesday. According to unconfirmed media reports, agents seized various items, including an endangered type of rosewood from Madagascar. Andrew Ames, spokesman for the U.S. Department of Justice, confirmed the raid but declined further comment. Gibson posted a statement on its Web site stating that it is â€œfully cooperatingâ€ with Fish & Wildlife officials. Late Wednesday, Gibson updated the statement to include a statement from Allen Hershkowitz, senior scientist with the National Resource Defense Council. â€œNRDC knows firsthand that the leadership at Gibson is committed to and informed about environmental issues, and we look forward to continuing our collaborations with this good and upstanding organization for many years to come,â€ Hershkowitz said. But an NRDC spokeswoman said the statement is from the past and is not in response to Tuesdayâ€™s raid. California Auctioneers will be auctioning one of the rarest rock guitars in the world; The 1958 Gibson Les Paul Standard. An amazing collection of over 70 Autographed guitars of the who’s who in rock n roll, contemporary art, and a rare collection of Marilyn Monroe and Michael Jackson Memorabilia. On Sunday Oct 11th, 10 am California Auctioneers will be selling one of the rarest rock guitars in the world; The 1958 Gibson Les Paul Standard. The guitar is a one owner guitar, and is completely original. The collector’s piece was owned by John Ford of Jersey City, NJ, who was proud to call Les Paul his friend. Ford’s private collection of guitars is one of the world’s best, and the estate has decided to offer the Standard which Les Paul played on many occasions at Ford’s estate. Also a major collection of autographed guitars by the who’s who in rock n’ roll, including The Who, Led Zeppelin, Rolling Stones, the Eagles, a Nirvana stage played guitar from Vince Neil’s collection, Ozzy, Santana, Clapton, Dylan, Slash, Cream, and Johnny Cash will be sold on the 11th. California Auctioneers is located just below Johnny Cash’s old estate, and he was known to frequent the bar where California Auctioneers now lives. Modern Art by Lichtenstein, Warhol and Rauschenberg and Vintage collections of Marilyn Monroe and Michael Jackson memorabilia fill the walls along with the rare and vintage guitars. There are oddities like Marilyn Monroe’s enameled pill box, Michael Jackson’s pill bottle and memorial programs. “This is the best collection of Americana history we’ve seen in our 45 years,” says Jewels Eubanks, auctioneer. The first of its kind, California Auctioneers’ sale promises to be full of rarities, excitement and fun and offers history to the highest bidder live, and online. Located on 8597 North Ventura Ave, Preview is Saturday Oct 10th Noon – 5PM with hors d’oeuvres, Auction starts at 10AM on Sun Oct 11th. To view catalog and photos go to californiauctioneers.com. 805-649-2686. In a downer moment that must have left countless concert-goers blinking, shaking their heads, and bellowing, “drag, man!” Guitarist Ronnie MontroseÂ actually stopped a show in mid-song, had the house lights turned on, and scoured the theater when his 1959 Gibson Les Paul Standard was stolen right off the stage. Montrose, a San Franciscan, hasn’t seen his guitar (which he bought from J. Geils) since that night on Oct. 10, 1972 when he played Dudley, Mass. with the Edgar Winter Band … until now. The San Francisco musician — who has played with Herbie Hancock, Van Morrison and others — claims that after 37 years of scouring and thousands of dollars spent on private detectives, his guitar has turned up in the possession of British musician and guitar collector Gary Moore — and, last week,Â Â Montrose filed suit in San Francisco District Court. 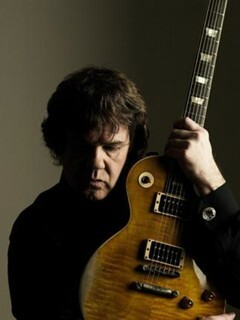 Reached at his home in Brighton, England, Moore refused to discuss the matter, saying only that the â€œwhole thing is a shamâ€ and â€œIâ€™ve had that guitar for more than 20 years.â€ Montrose doesnâ€™t dispute that notion, but he insists that doesnâ€™t change the fact that Moore is in possession of his stolen guitar and must return it. An angry Moore refused to comment further on his tussle with Montrose over the decades-old instrument. The legal ramifications of the case are complex, and Montrose hopes to get a judge to weigh in on several issues, including the statute of limitations on a 37-year-old case and an instance in which the current owner of a piece of stolen property is not alleged to have stolen it. Another major issue is jurisdictional, as the theft is alleged to have occurred in Massachusetts, its current owner lives in England and Montrose lives in San Francisco. Ed Roman, owner of Ed Roman Guitars in Las Vegas, has served as an expert witness in stolen guitar cases for the estate of late guitar great Jimi Hendrix. He said Montrose faces an uphill battle, primarily because the alleged theft occurred so long ago. Guitar thefts have long been common in the music business. R.E.M.’s Peter Buck had his prized Rickenbacker guitar stolen in September in Helsinki, Finland, only to have it returned anonymously two weeks later at a show in Luxembourg. Slash of Guns N’ Roses fame had his Gibson Les Paul Goldtop guitar stolen from his studio in 1998, and Gibson eventually made a new one for its longtime star client. Montrose’s hunt for his guitar has been rife with false leads, missed opportunities and dead ends.Â In January 1977, someone contacted one of Montrose’s bandmates about the guitar’s whereabouts, only to disappear when Montrose hired a private investigator to look into it. The hunt regained steam in the early 2000s when Indelicato was given a photo of a 1959 Gibson Les Paul by another guitar dealer at a Texas guitar show and told that Montrose’s instrument was in the hands of an English guitar player. The photo showed the guitar’s serial number, and Indelicato claims that an Internet search for the serial number sent him to a forum thread on the Gibson Web site that connected Moore and the serial number for Montrose’s missing guitar. But it was the November 2007 issue of the British magazine Guitar Buyer that ignited the standoff between Montrose and Moore, who once played for Thin Lizzy as well as being a well respected solo artist. The publication featured a multi-page spread on Moore and his guitar collection, including several photos of a 1959 Gibson Les Paul Standard. The Sunburst guitar is known for its distinctive maple wood face with unique wood grain patterns. Montrose claims a photo showing a pin-sized hole in the back of the guitar is the proof, as he drills such holes in all of his guitars. An angry Moore refused to comment further on his tussle with Montrose over the decades-old instrument. But his quote in the Guitar Buyer story shed light on its value to both men. We made a road trip this morning to visit the Wembley Guitar Centre in North London, sitting almost in the shadow of the new Wembley Stadium. Mark (the manager) and Matt couldn’t have been more friendly and helpful, allowing us to grab whatever guitars we fancied and wailing away with Boogie and Engl amps in their nice Â (soundproof!) testing rooms. Wembley Guitar Centre have recently become Gibson dealers and one model that caught our eye was the new custom shop Les Paul Axcess. This new model has a re-sculpted “heel-less” neck joint, making the upper fret access much more comfortable compared to a regular Les Paul. The other main change is a Floyd Rose tremolo. Considered to be sacrilege in the Les Paul playing community adding a Floyd Rose does widen the appeal and options for new, more metal based players I guess but more traditional Les Paul fans will be knashing their teeth! The body has also had a “belly cut” added on the rear, and is chambered inside, making it considerably lighter than the other Les Pauls on display. It sounded great, with two “burstbucker” pickups and the playability was excellent, although I personally I find the painted neck not to my tastes. These guitars are only (apparently) going to be custom shop models, so will be pretty rare and I am predicting, collectible in the future. I think the ideas for this model have come from the very exclusive Neil Schon custom shop model, which has many of the same features, albeit for an even higher price. The Axcess isn’t cheap, at Â£2400 but it may well hold it’s value in the future as an unusual take on a Les Paul. UPDATE: Now is appears that the Axcess is available without the Floyd Rose, which I assume, will have a lower price point than the tremelo version.